Since two heads are better than one, this tandem kayak is a smart purchase. 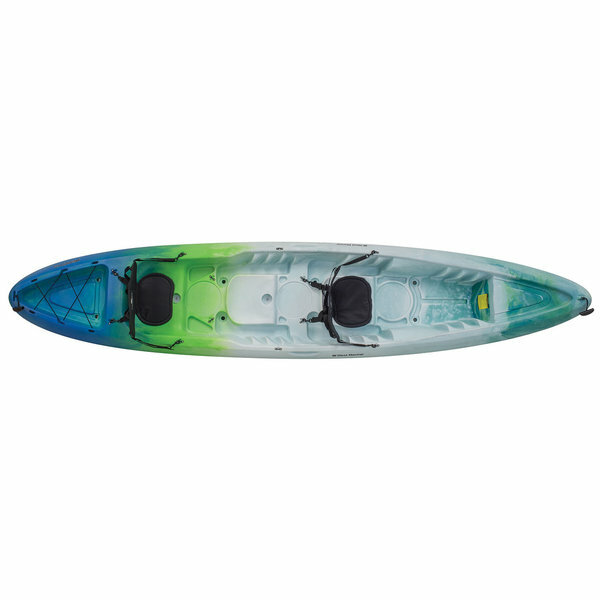 Our Abaco 13.5 Tandem Sit-On-Top Kayak is designed so that novice and experienced paddlers alike will enjoy recreational paddling in conditions ranging from flat water to flowing rivers to small surf. Why does buying a tandem over a solo make sense for a lot of people? In a word: versatility. There's not only the social component to paddling together as one, you also benefit from increased speed with double the number of paddlers. And if storage space is an issue, one tandem takes up less space (and costs less) than two solo kayaks. If you're new to kayaking, why choose a sit-on-top over a sit-inside kayak? While you're more likely to capsize with a sit-on-top kayak, getting back in is much easier for beginners than learning the eskimo roll with a sit-inside. The center of gravity is higher and a little less stable, but you have a better view of the water (and potential obstacles) around you. Since you are also more open to the elements, expect to get wet. You'll want to wear clothing that dries quickly if the water's warm or provides warmth when you're in cold water environments. Designed, molded and hand assembled in the USA, the hull on the Abaco 13.5 combines stability, maneuverability and speed for fun and adventure on the water for everyone in the family. This buoyant design also gives you the capacity to carry a whopping 550 pounds including everyone and their gear. Made from roto-molded polyethylene, it's flexible and impact resistant so it will endure many years of the drops, dings, scrapes and various other "oops" moments in the typical life of a recreational kayak. The Abaco 13.5 features a roomy cockpit with several details that make it comfortable for most paddlers. A molded-in foot brace system allows you to adjust your leg positions for optimal paddling and then shift positions or stretch out during the day as needed. Scupper holes are found in several places so water that finds its way over the deck will automatically drain out so you won't sit in a puddle of water all day. The seats are where this kayak brings more to the party. The adjustable, removable, padded back supports and seat bottoms will accommodate two adults comfortably in the furthest bow and stern positions. You can also remove one seat and move the other seat to the middle position for better weight distribution if you're paddling solo. There's plenty of room for bringing along your progeny or man's best friend as well. Deluxe stern rigging gives you a place to stow items like dry bags (sold separately), jackets and other essentials within easy reach. Bow and stern toggle-style handles not only help with portaging, they also provide handy tie-off points for docking or anchoring your kayak. Molded-in side handles are placed at the proper balance point for one person to carry it. A stern deck well with scupper holes completes the feature set.